SLA has adopted the recently developed Lacrosse Athlete Development Model (LADM) from US Lacrosse, the national governing body for the sport. The LADM emphasizes small sided instruction and games, resulting in more touches per player and greater opportunity to grow with the sport. You can read more about LADM here. Again in 2019, SLA will be offering both a Local Recreation lacrosse program as well as competitive league play through our continued membership in the Northern Virginia Youth Lacrosse League (NVYLL), one of the largest recreational youth lacrosse leagues in the country. It is SLA's intent to offer both Local Rec and NVYLL options at the 10U, 12U and 14U age groups again in 2019, but overall registration numbers and player preference will determine the final shape of the offering at each age group. The 6U and 8U age groups will be Local Rec only. See the age group eligibility (by birth date) and program summary chart below. *14U players cannot be in 9th grade; current 8th grade boys with birthdays before 3/15/2004 will be considered. If your son is in the 8th grade and has a birthday between 9/1/2003 and 3/14/2004, please reach out to the Boys Program Commissioner. Note: All players must participate in the appropriate age bracket based on their birth month and year. No waiver requests to ‘play up’ in an older age group will be granted on skill or ability; in unique cases of age/grade combination a waiver to ‘play up’ in an older age group may be considered. No player will be allowed to play down an age group. The Local Recreation playing option will feature small-sided instruction and all practices and games are in Stafford County. Season runs March through May and will consist of up to two practices per week and up to 6 games on Saturdays. All first year players (players with no previous lacrosse experience...e.g. a spring season) MUST play in the Local Rec option. Second year players (one previous year of experience) should play in the Local Rec option, but can register to play in the NVYLL league with a coach's recommendation and a successful pre-season assessment to one of those teams. Local Recreation divison teams and final playing format will be determined in March after several group practices and once all registration numbers are known. The Northern Virginia Youth Lacrosse League (NVYLL) is a group of 24 recreation associations throughout northern Virginia (from Spotsylvania County to Loudoun County) that band together to offer youth lacrosse at multiple skill levels. Although this league has sub-divisions for players of all skill levels, SLA's approach to this league is that it is for our more experienced players, especially ones who are looking for a broader exposure to the game and a more competitive recreational lacrosse experience. Participation in the NVYLL levels of play consists of up to three practices per week, an 8-game regular season and a playoff experience. The season runs from February (assessments) through early June (playoffs). The NVYLL playing option is only available at the 10U, 12U and 14U age groups. All NVYLL age groups play 10v10 full field lacrosse. The player will be evaluated during pre-season skills assessments (February 2, 9, and 16). Weekday practices will begin as early as the week of February 18, depending on field and coach availability. NVYLL games are played throughout Northern Virginia with roughly half of a team's season played at our home field at Embrey Mill Park. Remaining games and playoffs will be outside Stafford County. Players desiring to play in the NVYLL program have a higher registration fee ($120 total) to cover additonal expenses associated with the league (field costs, officials, league insurance, etc.). SLA's final number of boys NVYLL teams and rosters will be set in late February or very early March, weather permitting. Because the NVYLL season begins earlier than our local rec season, the ability to choose this playing option during registration will expire in early-February prior to team assessments beginning. Register for the NVYLL playing option by February 7th. NVYLL registration fees are higher due to additional costs associated with league play. Any player registered for the NVYLL propgram that is not assessed to a final NVYLL team roster will be moved to the Local Recreation Division and receive a refund for the $60 difference in registration fees. NVYLL: March 23, 30; April 6, 13, 27; May 4, 11, 18; (No games Easter or Memorial Day weeknds). Single elimination playoff games will be held June 1, 2, 8 & 9. NVYLL teams practice up to three times per week, Local Rec teams will practice up to two times per week...both divisions will play weekend games on Saturdays throughout the spring. In 2019, members will again order their uniforms directly from our selected vendor following the registration process. Uniforms for 2019 will match those used in 2017 and 2018. Uniforms are only required to be purchased this season if you are new to SLA, or if your previous uniform is too small or in bad shape. Uniform ordering information is included in the confirmation email you receive upon completion of the registration process. If you are a furloughed government family and are opting to complete payment at a later time, please reach out to the Boys Program Commissioner at to receive the link to the uniform store. The Commissioner will confirm your registration status and provide the store information. The 2019 uniforms are identical to the 2017/2018 uniforms. If you are a returning player whose current uniform still fits and is in good shape, no purchase is required. New players and those requiring new sizes should purchase the required items. SLA has established a program to provide some equipment for sale at a reduced cost as well as a rental and loaner programs. More information is provided on our Equipment Rental page. Please see the Equipment Exchange page on the menu to the left, under Equipment Requirements for our latest available items for sale and current pricing. 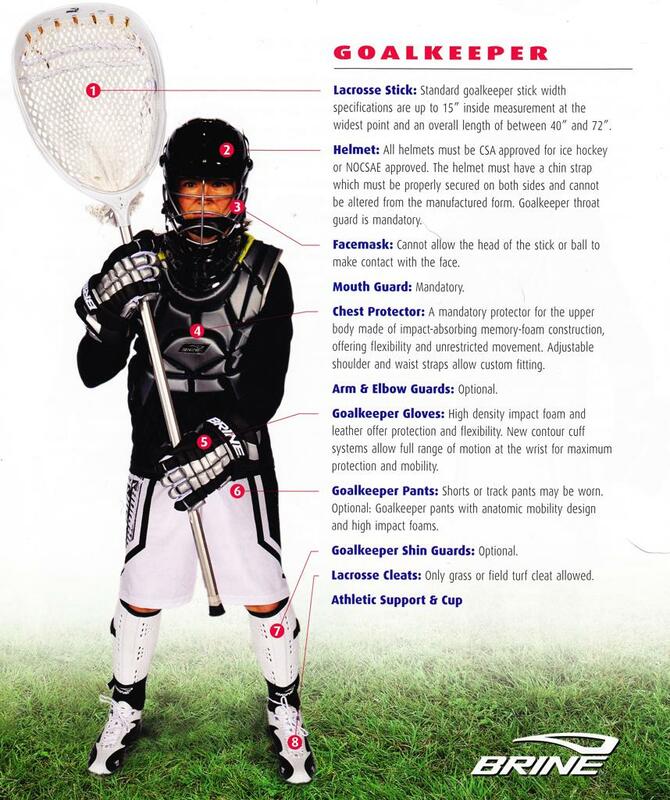 **Being new to lacrosse and trying to find the right equipment for an acceptable price can be challenging. If you have questions, or need some pointers, on what gear to get, where to get it and how to maximze your approach, please do not hesitate to ask the SLA Boys Commissioner at . Many of us have been doing this for a while and are happy to help point you in the right direction. 7. Cleats - Plastic or rubber sole with cleats 1/2" or less in length. Recommend lacrosse, football, or soccer cleats. No baseball cleats.